For whatever reason, Xato does not understand the message coming down the rein so it is my job to make it easy for him. We began, over four months, by starting on the ground and installing a disengage, and then progressed to asking him to flex and give to either rein – both in hand and under saddle. We have also had three sessions of bodywork done and his saddle checked and fitted. Progress was steady, but sticky in places, and if I had been plotting it on a chart then the green line of his improvement in hand would have risen much quicker than the blue line of his ridden work. Having a rider on bored makes him feel more vulnerable, and therefore more inclined to make his own decisions. A couple of weekends ago, I had Ben ride him for me in the arena. I was quite pleased with how Xato and I were getting on, but wanted Ben to feel for himself and be able to offer suggestions for further improvement. I had ridden Xato two days earlier in the hill field and had even been able to do serpentines – so I was horrified when Ben picked up a rein and Xato immediately put all his strength into going the opposite direction! No matter what rein Ben asked with, Xato would brace and go the other way. I couldn’t make sense of it and hoped that Ben didn’t think I’d been blithely riding around on this juggernaut. Ben worked him through it by just setting up the cue and waiting for Xato to offer a change that he could release to. It took a lot of waiting. The next day we worked at liberty, which was intended to teach Xato about the benefits of just hanging out with and listening to us funny two-legs. When we work at liberty, the intention is not to chase the horse/mule and make them run until they give up – we want them to want to be with us, but if they choose to run then that’s oki too. They aren’t punished for leaving. Xato chose to run after he was asked to turn away and found himself rather overwhelmed by the concept. What was interesting about this choice was that he then ran around the arena for a solid seven minutes before finally, finally, deciding to pay attention to Ben who had been standing quietly in the centre. This was quite surprising to me because even Marty has never spent so long, and exerted so much energy in one solid block, before considering that the person may be the easier option. 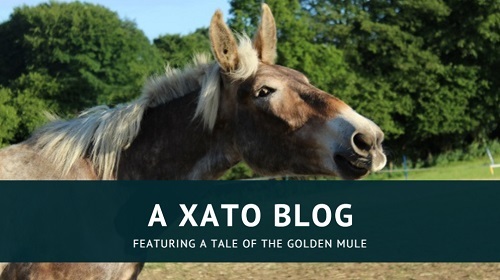 Xato is gentle, affable, friendly, easy-going and loves all people – what made him feel like he had no choice other than to run? After that we got some better stuff, and we were interested to see whether his willingness to work with us – and therefore his steering – would be improved. Unfortunately, after that Xato then had a week off, which I think is the longest he’s had off work since he arrived. The day after the liberty session was when our chiro had been booked to visit, and she recommended two days of rest after treatment. The remainder of the week were my busiest days at work so I had no time to do anything other than general chores, and when the weekend arrived my motivation was at an all time low due to foul weather and a flare up with my lordosis. However, Monday dawned bright and sunny, I felt much more mobile, and so at lunchtime I brought Xato in and tacked him up ready to ride. I didn’t actually ride in the end because I couldn’t find my helmet, but as his energy seemed quite up I probably wouldn’t have got on him anyway; he was moving out a little faster than usual, and his responses to my questions were quite slow. So we stuck with groundwork and got some nice bends and turns. On Tuesday morning, I had booked a lesson with Ben first thing before he went to work. This had to be cancelled last minute, but as I was tacked up anyway (and had found my helmet), I decided to just get on and ride. I have often ridden by myself and his energy felt much more positive than the previous day, so I judged it safe to get on board. I had successfully asked him to give to both reins from the ground, and was excited to see if his steering under saddle was any better. My plan was just to test it out at the halt, then maybe ride a couple of circles and end early on a good note. The arena was flooded with the weekend’s rain so I rode in the lower half of the hay field, as I have often done before. I got on, settled myself in the saddle, and was just sorting out my leadrope when Xato started to move off. Automatically, I picked up one rein to ask him to stop; instead, he pulled against it and I had to really fight to stop him just turning around and taking me back to the gate. I got him stopped, asked him to look right, and again immediately entered a pulling match. I could could get him to turn left, if I pulled, but there was no right turn at all. It used to be that he found left more difficult than right so I was surprised both by this and by his absolute refusal to even entertain my ideas about what we should be doing. With hindsight, I realise that this is the point where I should have got off. There was no steering and, in the large area of the hay field, it certainly wasn’t safe. But that little part of me, that still clings on to the traditional horsemanship I was taught as a kid, persuaded me that getting off now would let Xato “win”, and that I should at least get him to turn smoothly to the right before dismounting and going back to groundwork. I also held the naive belief that if he did go anywhere, he would only take me back to the gate. I figured this was as good a time as any to work on the theory of how to deal with a gate or buddy sour mule: if they carry you back to the gate, then just make it a little uncomfortable for them to be there and offer them the peace they seek when they move away. So when the next attempt to turn resulted in Xato pulling straight through and striding back to the gate, I began bumping with my legs when we got there; just enough to be mildly annoying to him. I didn’t mind where he went (…ha! ), I just wanted him to change his thought. It might only be one step, but I would reward it and then ask for more later. Unfortunately, my plan worked a little too well. And off he went at a trot, over to the gate in the bottom corner of the field that he has sometimes been led through in order to work in the hill field, or to cut across the fields back to his paddock. I had no control at all, and found that the more I tried to turn his head the stronger and faster he got. Instead I concentrated on sitting tall and deep in the saddle, imaging us getting slower and heavier, and was able to bring him down to a walk just before we reached the gate. Now, this is the second opportunity that I had to get off. I am not telling this story to make myself look good (none of the stories on this blog make me look good). I am telling it in order to add to my chronicle of failure, so that I can (hopefully?!) learn from the experience and maybe someone, somewhere, will read this and take something away from it too (i.e. don’t be an immutable idiot like me). I didn’t get off. If getting off at the start was teaching him bad behaviour, then what would getting off after he’d bolted with me do? Absolutely not, said my idiot self; quell those trembling limbs and ride him back to the gate. He only came over here because he knows this gate is sometimes an exit. He’s not going to go anywhere else. Build his confidence by letting him do something easy and achievable for a few minutes and then try again. I was also in denial about how bad our steering actually was, considering how much improvement there had been before; stupid, I know, but I couldn’t quite believe that I now had nothing. I have to say, he actually walked really nicely back to the main gate. I even had steering and was able to tip his nose from left to right. Relief washed over me as I decided that I’d gone through the hard part, and now my mule was willing to negotiate. So as we reached the gate, I asked him to circle right. And he took me back to the other gate at a trot, again. And then when we reached the gate, he turned around, shifted up a gear, and took off diagonally across the field. As before, the reins were as good as useless, so I tried breathing deep, sitting ‘heavy’, and willing myself to be a calming presence and not something that would cause him to want to keep running. It didn’t work. In fact at one point he actually turned his head so far to the right that I was looking directly at his eye; ah, that wonderful ability mules have where they can run straight while looking in the opposite direction to where they’re going! I had witnessed Marty doing the same many times in the field. How interesting to experience it under saddle, thought my brain, whiling away the time and the rising hysteria with scientific study. There is a third gate set just above the arena, and it was there that Xato was headed. It is padlocked and he has never been through it so I’m not sure why he thought it might offer him comfort or an exit, except that it looked very much like the other two gates he’d already tried and he was still determined to exhaust every other possible avenue before considering me as a viable alternative. This time I knew I was definitely going to get off, regardless of what my inner BHS instructor shouted at me. He would reach the gate, stop, and I would dismount … except that he didn’t stop. He reached the gate, paused for a nanosecond, then turned left and went up the narrow track between the boundary fence and the huge piles of soil, building rubble and arena surface that line the very edge of the four acre field. The track was a dead end, as our fencing was still up from our winter field; I knew that the only options available were for him to either blast through the fencing, turn left again and go over the pile of bricks at the end, or – and by now this seemed like the least likely option – stop. Luckily, he chose the latter. The mule brain finally kicked in and he seemed to realise that he was going to get himself injured if he carried on; he slowed down as he saw the fence blocking the end of the track, and for one hair-raising moment tested the brick pile by putting a foot on it – but changed his mind, and I was able to jump off. I worked him in hand for a further forty minutes, during which time he bolted twice back to the main gate. The first bolt was when I was working him on a circle, and he decided my energy was too high; and the second was when I leading in a straight line away from the gate and asked him to stop dragging. Energy is definitely something he has difficulty dealing with. I ended the session with a long period of just standing still, and asking Xato to back up several steps every time he took one forward. He found this extremely difficult but figured it out eventually. Allowing him to control the placement of his feet at such a minute level may not seem like a big deal, but as demonstrated it leads to much bigger problems further down the line. 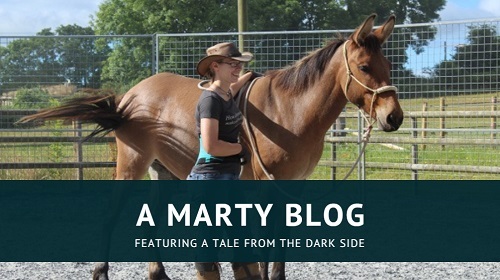 Part Two to follow: help from friends, a well-timed clinic, and Equine Breathing. I bought a mule 5 years ago that was elderly. He had been driven but I found his past owner ( of 15 years or so) he said he wasn’t okay to drive single. No brakes or turn. And find out where he wanted to go. He really did have a plan, 5 gates, 2 leading away from his destination, got us to a mares’ pen across the road (still my place). I was just starting to ride him, a day or so before this, when I opened the gate from the saddle. Boy was he ever surprised! He stepped back, sissored his ears, then stepped through. It was enlightening for me ( a horse girl since age 3 now 55) was how much of a personal agenda they have. They express it so clearly. Have you noticed how they truly envy and admire what we can do with our hands? Sancho was close to 30. At first we thought he was beyond 30. The previous owner revised after giving it some thought over time. Sancho had a lot of time to figure these things out. There were times Sancho volunteered things, too later when we were able to leave the corral. Sancho was put down in late August of 2014. We had two great years together. On my fb site I have many photos of our adventures, including a swim in the creek. He loved the water. Many happy days ahead for you. Your mule will not fall. They can stay upright on or through darn near anything. He will get better at keeping you aboard , too. Wait and see. Hi Carla, thank you for your comment – I really enjoyed hearing your story. 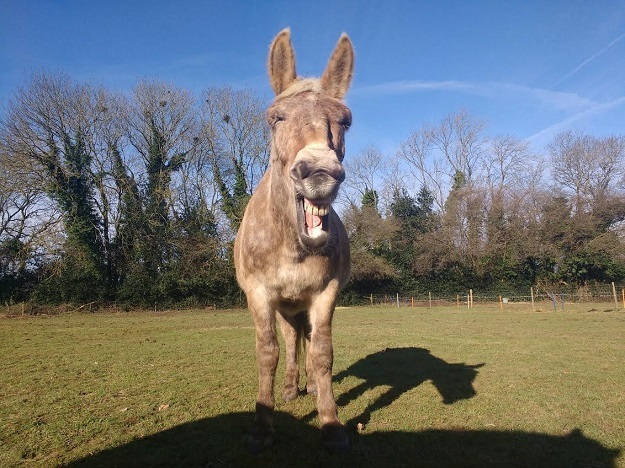 Sancho sounds like he was a great mule and I am truly sorry for your loss … they have such incredible personalities that I know it will be hard to lose one. I’m half-tempted to see what Xato would do if I just opened the gates … I suspect he would take me back to his friends, but who knows; maybe he has a different agenda. Hi. Thank you for your very frank account of events leading to the bolt. My 15hh donkey does the same head turning in the opposite direction to the way I ask if she does not want to go that way. I only use a side pull bridle as I feel that a bit etc would only set up pain, fear and more resistance. I have to persuade her that it is a great idea to go the way I would like to go! Often does not happen! She is only five so we are just ‘playing’ in the school. I think you are very hard on yourself, we all have a tendency to revert back to the original way we were taught. I know that when she starts to set her head I still hold onto the rein too long, even though I say at the beginning I will release immediately, sit still and then ask again. That extra nano second or longer of holding confirms the resistance! Maybe now I have typed this and realise how ridiculous I am being I might be able to achieve instant release and breathing out! I do enjoy your tales, albeit I came in late. Is it Ben Hart who helps you? Hi Lesley, thank you for leaving me a comment! I feel like we are on the same page when it comes to bridles. It has been suggested that I use a bit now, but I am not keen to do so for reasons that I will explain in part two. I’m interested in your comment about releasing immediately / that holding the rein confirms the resistance. I would normally hold the rein until I was given something that I could release to; is it different in donkeys? I noticed during Xato’s first bolt that the harder I tried to hold him, the faster he got. When I gave up and just focused on slowing down my energy he slowed down too. Perhaps this is where I’m going wrong. No, Ben is my fiance, an accomplished horseman who is responsible for me having any concept of horsemanship at all. He is also the reason I have mules! I rely on him a lot when it comes to working with them. Playing off the comment above I do think that holding the pressure when he resists is not the best answer. 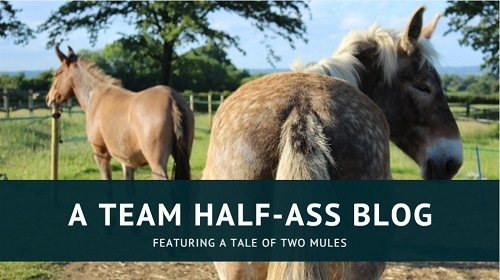 I know with Kitt (and I hear Fjords are one step away from mules at times!) holding against a brace is an exercise in futility. She just sullies up against it and gets stronger, stiffer, and heavier. If I use pulsing pressure by softly picking up a feel and if she doesn’t respond I bump her off of the contact and pick up a soft feel again, rinse and repeat, I get a response much quicker because dropping the contact between picking up a feel means she can’t lean on it and the pulsing pressure is just annoying enough to encourage her to figure out what I want. I will emphasize that the bump is not a jerk. A jerk comes without warning and tends to produce a “what was that for?” response. The bump you have the warning picking up the soft contact and then the pressure increases on top of that before disappearing and picking up the soft feel again. Obviously if he responds to the soft feel you don’t have to add more pressure. Yes you ultimately want him to give and follow a soft feel, but you don’t want to give him something to lean into, especially if he tends to zone out. I look forward to reading Part Two.